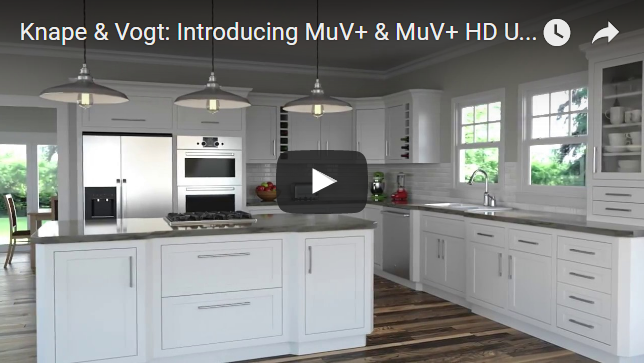 MuV+ and MuV+ HD Undermount 75-lb. class medium-duty and 120-lb. class heavy-duty slides are redesigned to be quieter, smoother operating and more flexible, with added post-installation adjustment features preferred by cabinetmakers. A redesigned pivoting latch on the patented soft-close module significantly increases sound dampening capability, making MuV+ arguably the quietest soft-close undermount slide on the market today. Additionally, an integrated pull-force module can be used in the field to adjust the soft-close to maintain smooth open-and-close operation. Three new release levers are available to improve cabinetmakers’ ability to custom fit installed drawers. A 1D release lever offers height adjustment while a 2D lever offers height and side-to-side adjustments. A 3D release lever offers height, side-to-side and inset adjustments to align drawer fronts flush with the cabinet face. The slides accommodate drawer material from 1/2"– 3/4" thick. MuV+ 75-lb class slide is available in lengths from 9" – 22". MuV+ HD 120-lb. class slides are available in 18" – 30" lengths, giving you even more choices in the undermount category.